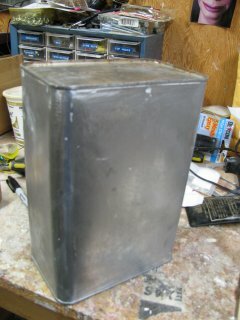 I thought I'd use a paint can for the robot figure's body. I thought that because that was what I could find. But I disliked the round shape. Then, while I was looking on one of my shelves for something else I found a can of mineral spirits. Exactly the right size and shape. The same as the one-gallon gasoline cans we used to be able to buy. Before everything went plastic. Exactly what I had dreamed when I was but a mere lad. 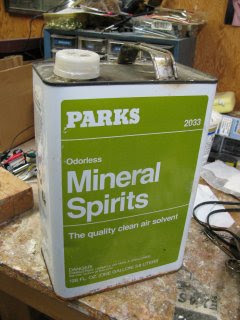 But what to do with the half gallon of mineral spirits still in the can? I hate to waste anything, particularly if it's going to kill my weeds, er, grass. And I don't want to pour it down the drain. But where to store it? Well, where else? How about that new, shiny round paint can I won't be using for the body? Done. Necessity is a mother. Next I set out to remove the pour hole and handle. Upon close inspection I saw that they are soldered on. I took out my handy soldering torch and hit the solder joints. 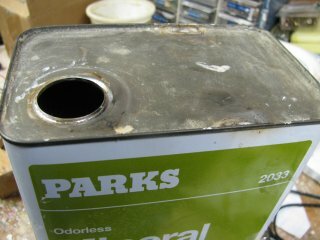 Even with the residual mineral spirits washed out with water, some fumes lingered inside that can. I saw some fireworks. Don't try this at home. Especially at my home. Both pieces came off cleanly leaving me this to work with. Then a few swipes with the electric hand sander removed the paint. This will be the perfect body. For a robot, that is. The dull metallic finish isn't going to do it, though. I'll deal with that issue soon.